It's a Monday morning. I've got about an hour until my flight departs for Dublin. The security line isn't bad today. Then again, airport security in Sweden is usually a breeze: no shouting TSA agents, no taking off of shoes, no hassle. They have one of those customer service "How Are We Doing?" consoles where you press a smiley or frowny face to indicate how happy you are. Normally, it's a full on Happy Green Smiley Face experience at ARN. The staff are professional, friendly, and fast. This one was an exception. I often fly to Dublin for work, but this is the first time I'm bringing my radio gear. In my carry-on, I've got the works: rig, antenna, Morse code paddle, and a 12V lithium battery. The battery is in my carry-on bag because a battery of this size isn't allowed in checked baggage. Makes sense. Lithium-based batteries have a unique chemistry that can react angrily to punctures, shorts, or other hostile conditions. Better it's in the cabin than in the cargo hold if something bad happens. Something bad isn't likely to happen. This is a battery from the most well-regarded manufacturer in the ham radio community: Bioenno Power. I own a few different batteries from them. The one I'm carrying today is the BLF-1209A, a 12V 9Ah battery that is good for 108 Watt-hours. This battery is one of their LiFePO4 series. Every time I bought a battery from them, they contacted me post-purchase, checking to make sure I was satisfied and asking if I had any questions about the product. Awesome! A lithium iron phosphate battery (LiFePO4) is a different animal than a typical lithium ion battery. For one, they're safer. From a chemical and thermal perspective, the oxygen atoms are much harder to remove than a typical lithium ion battery. This means that if the battery gets damaged or punctured, a fire is less likely to break out. LiFePO4 batteries are also safer during the charge cycle, particularly when they're paired with a built-in PCM (protection circuit module), which guards against overcurrent, undervoltage (overdischarge), overvoltage and short circuiting. Discharging a fully charged BLF-1209A with a typical duty cycle for my KX3 + PX3. For all these reasons, I felt confident that I wouldn't encounter any issues when bringing the battery on my trip to Dublin. Still, I read up on the airline's restrictions on lithium batteries. Somehow, I must have missed the part that says that the limit is 100 Watt-hours. The battery I was carrying was 108 Wh -- barely over the limit. As I made my way through the security line, the battery was naturally flagged for further inspection. Eventually the security folks cleared it, pending approval from the airline. They escorted me back down to the check-in counter, where an SAS (Scandinavian Airlines) rep broke the bad news that it would not be allowed on the flight due to the 100 Wh restriction. Bummer! I had nowhere to store it, and shipping lithium batteries is even more troublesome than carrying them on a passenger plane. I had to forfeit it. After I arrived in Dublin, I posted on Bioenno's Facebook page what had transpired. Within a few hours, I was contacted by their customer support. They offered to replace the confiscated battery -- for free. The quality of the product stands on it own, with rave reviews from hams across the globe. The customer care exhibited when they offered to replace my battery is next level. Within days, they had shipped a brand new (and newer model) BLF-1209 to my shipping location in the US. If you're looking for a battery for ham radio, or really for any application, check these guys out. They take care of their customers, and their product straight up performs. After I got licensed and became comfortable with simple phone (voice) operation, I noticed that the salty dogs in the local DX club were almost exclusively using CW, or Morse Code, on the radio. They practiced the art of radiotelegraphy: where the contacts were easier to make, the operators were more skilled, and the signals were stronger. I wanted in. When I tell people I'm interested in radiotelegraphy, the most common thing I hear is "Morse Code? Why don't you just talk to people through the phone / Facebook / text?" Well, for the same reason a marathon runner doesn't hop on the bus and ride for 26.2 miles to the finish line. The attraction is the journey you undergo to reach the arbitrary goal. I set a goal for myself at the beginning of his year: by the end of 2015, I wanted to be able to copy and send CW comfortably at 20 WPM. In my head. No pencil and paper. I reached that goal last month. Here's how I did it. Like countless CW noobs before me, I started out in with Gordon West's introductory 0-5 WPM Morse Code tapes. I insist on calling them tapes, even though they come as a set of eight CDs. That's because they're straight up dubbed from the original tapes, complete with Gordo telling you to turn the tape over for the next lesson. The audio quality is pretty dodgy, but so is that far-away DX coming over a polar path, so it's fine. The goal of this box set is to bring you from knowing zip about Morse Code, up to the point where you can pass the exam that used to be given as part of getting the now-defunct Novice license. That exam was a five minute session of copying code sent at a character speed of 15-18 WPM, but at an effective speed of 5 WPM. This is based on a well-established principle, the Farnsworth method. With Farnsworth spacing, the individual characters are sent at a relatively fast speed, but with spaces inserted between the characters and words to give you time to recognize them. Over time, you gradually reduce the inter-character and inter-word spaces until the character speed matches the effective speed. At that point, you're copying code at standard Morse spacing. Gordo's 0-5 WPM course uses the Farnsworth method, and he's clear that you devote a notebook to the course and write down everything you hear. He starts you out with the simplest letters: E and T. From there, the following lessons add additional characters and start building them into words. Although his patter is corny, it makes it fun and enjoyable. In tandem with the Gordo tapes, I also used the MFJ-418 Morse Code Tutor device. Like the Gordo tapes, this device is from a previous era before smartphones and Morse Code training apps. It's small, highly configurable, and the battery lasts forever. I set the MFJ-418 to send groups of random characters in five-character blocks. For instance, if all the characters I knew so far were E, T, A, N, I, and S, the code groups might look like this: SIISA TANTI EEISE SETIA INASE ETTTA AISTA. I set it for a duration that produced about five lines in my notebook. I'd usually do fifteen minute practice sessions once a day, until I could easily copy all the characters in the set without making more than one or two errors. Once that was done, I headed back to the next Gordo 0-5 WPM lesson to learn another few characters. Then back to the MFJ-418 to cement them in my mind. Rinse, repeat, until all the characters were learned. Pretty soon, I had filled up a sixty page notebook with the copy from the Gordo tapes and these random code groups. I also found another means of generating those random code groups: an excellent iOS app called Ham Morse. This highly configurable app supports Farnsworth spacing, gradual introduction of characters, random code groups, words, practice QSOs, and even pulling live news headlines and sending them as CW. Because I was using the Farnsworth method, it was easy to start increasing my copy speed. All I had to do was decrement the inter-character and word spacing slightly. Even before I had learned all the characters, I began slightly speeding up the code groups from Ham Morse and the MFJ-418. First 6 WPM effective speed, then 7-9, all the way up to about 11 to 12 WPM (the actual character speed staying at 20 WPM). With each bump in speed, my accuracy would take a dive. I just had to ignore the frustration and keep moving. As soon as I had a couple of pages at the new speed with minimal errors, it was time for another 1-2 WPM increase. This was also about the time that I figured I should start practicing sending Morse Code. In the old days, folks used a straight key, but modern CW ops use a paddle and keyer. If you don't already know, a paddle is basically a switch with two finger pieces, and a keyer is an electronic device that produces standard-length dits and dahs. Most modern radios have a keyer built in. I decided to skip the straight key entirely and focus on paddle technique, since that's what I would be using once I got on the air. It's a Palm Radio Mini Paddle, Code Cube, and Tone Tube. They all fit nicely on a slab of heavy steel, which keeps the rig from moving around the table when I key it. This practice rig (plus the MFJ-418 or Ham Morse) gives me pretty much everything I need to go anywhere and be able to work in a daily send+receive practice session. It doesn't provide decoding of the sent CW. In other words, I still needed a way to ensure that the code I was sending was clean and had correct spacing. I use a program on my laptop called fldigi to listen to the audio sent from my practice rig and decode it on the screen. It's not flawless decoding, but it works reasonably well. I continued the same routine as above: copy random groups of characters, then send those same groups on my practice rig. Repeat. Proficient? Increase the speed. This worked well and got me up to about 18-19 WPM over several months. But what I was I really building skill at? Copying and sending random groups of characters? That's not real life. Introducing: words! I was in for a surprise when I set the Ham Morse app to send plain English words. I kept dropping letters and entire words. Where I could copy 18 WPM code groups with high accuracy, I just fell apart when trying to copy words sent even at 15 WPM. I believe what was happening was that it took all my concentration and focus to decode the 18 WPM code groups. Once I changed to words, another part of my brain was engaged in trying to guess what the word would be. That context switch delayed my decoding. I worked at writing just the individual letters as they were sent, and tried not to think about the complete word. Frankly, this wasn't very fun. I had gotten very comfortable with the random code groups, and it was discouraging to take a significant step backwards in terms of copy speed. On the advice of one of my mentors, K4XU, I just kept slogging away at the practice, and eventually got back in the groove. Ham Morse will also send practice QSOs. It simulates a transmission from another operator, kind of like playing the computer opponent in chess. You can configure the app with your call sign and name, and the fake QSOs will use that information to make the sent text more realistic. To practice sending with this feature, I copy the QSO down on paper, then use my practice rig to reply to the imaginary other operator. This is a great way to build on-the-fly sending skill. Up to that point, I was sending by reading letter for letter from what I had already copied. I don't remember exactly when it happened, but one day I dropped the Farnsworth spacing altogether. I think this was around 15 WPM. From that point on, I only practiced with normal spacing. This happened on February 14, 2015, about six months after I first started serious practice. I was chatting with Carl, KB9DKR, in Tennessee. He was operating a club call, KE4BSA. We were talking about learning Morse Code, and he suggested we switch modes to CW and continue the conversation. I was really nervous, but I agreed. I'm sure my hands were shaking. We exchanged RST (signal reports) and did the conventional exchange of call signs, and he congratulated me on having my first real CW QSO. This was awesome! We switched back to sideband to continue the contact over voice, but I went ahead and logged the CW contact separately -- the first in my log. Once you get to the point where you can send and receive with reasonable accuracy, it's time to add real QSOs on a regular basis. I've been doing this as much as possible since that first QSO above. Until a couple of months ago, 20 WPM with pencil and paper was as fast as I could go. Even at that speed, I wasn't able to copy everything in a typical QSO. There's just a limit to how fast a person can write. Level 2: (intermediate, operators who know Morse and can operate comfortably at speeds between 11 and 15 wpm; meetings are held online and on-the-air) The objectives for Level 2 training are to increase one's speed above 15 wpm through practice with head copying and sending; to hone one's skills in conversational QSOing, contesting and DXing. This course was led by Ed, K6HP, and it was great. It gave me the confidence and skills to put down the pencil and begin copying Morse Code in my head. We met twice a week, and though these sessions had a lot of talking, the real practice was done as homework. Ed encouraged us to write down only the other op's call, location, and signal reports. After all, if you start to get lost, you can always fall back to pencil and paper. In January 2016, I'll be starting CW Academy's Level 3 class with K6RB, the founder of CWA. He assures us that by the end of the class, we'll be doing a solid 25-30 WPM head copy if we practice diligently. Comment below if you have a great CW learning resource you'd like to add to this list. At my company, work/life balance is a frequently discussed subject. Although the software engineers probably have the worst time of it, it's an issue that most of us face. Late nights and weekend work are the norm for a lot of my coworkers. I believe that people who have problems with work/life balance have made a choice -- for their careers, for money, or for personal satisfaction -- that can often lead to resentment in hindsight. I've been that guy, but that's not how I operate today. These days, I find I'm able to put in my best work by breaking up the work day into periods of intense focus, with occasional breaks where I do something else -- anything but work. I love my job. I get to play with cutting edge hardware that's changing the datacenter industry. I get to work with and learn from wicked smart people. More importantly, I get to spend most of my time doing the stuff I'm good at doing. If you work with me, you'll often see me eating lunch at my desk. Those are the days when you likely won't see me later that afternoon. 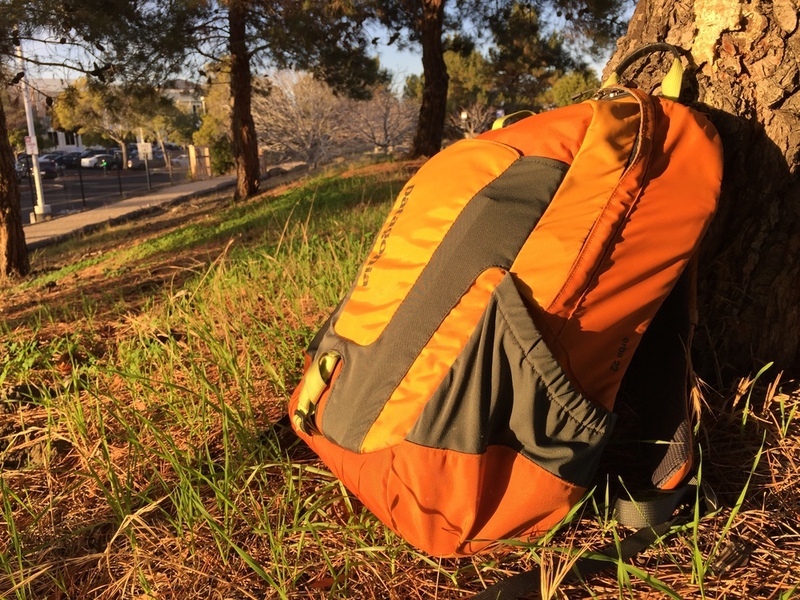 I'll block off an hour on my calendar, grab my backpack, and head out to the nature trail that runs around the perimeter of my office campus. My bug-out bag: radio, antenna, tuner, rope, and everything else I need to make a few contacts on my break. There's this one spot on the trail where there's a nice tall tree, with branches that are just right for catching a rope thrown with a lead weight on the end of the line. In short order, I can have an end-fed wire antenna up about 40 feet in the air in a sloper configuration. 60 feet of copper clad steel, supported in the top branches of that blurry tree in the background. Once the antenna is in the air, I attach the near end to the 5:1 transformer needed to bring the wire's impedance down to a range that my tuner can easily cope with. I tie this end off to another tree at eye level so that the whole antenna is off the ground. I really like this antenna. It's simple, easy to set up, and can be set up in a variety of configurations: sloper, inverted L, or even hanging out the window of a tall building. As with all end fed antennae, it works better if you attach a counterpoise to provide a reasonable ground plane. Here, I'm just using a long piece of wire clipped on to the ground terminal of the transformer. The counterpoise runs in the same direction as the antenna wire. Some brief tests indicate it doesn't really matter which direction the countepoise runs. 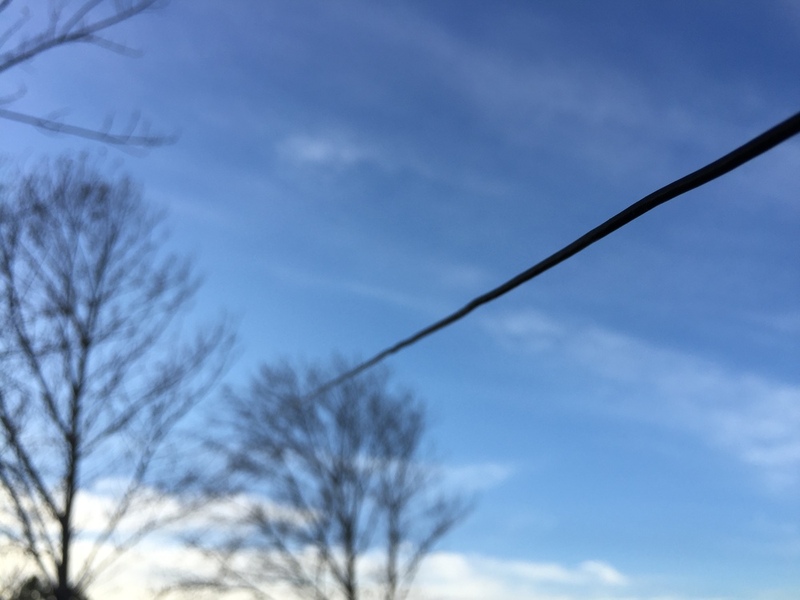 After the antenna is deployed, I connect a 50 foot length of coax to the antenna and run it along the ground to my operating position -- about 35 feet from the antenna. The long coax acts as a second counterpoise, which means there's RF on the shield of the coax. That's OK, but I've found it sometimes does funny things to the sidetone of the radio. For this reason, the coax has a series of toroid chokes on the radio end, effectively damping any stray RF before it gets into the radio. The counterpoise (red alligator clip) is attached at the bottom of the transformer. The rig I keep at work is a heavily modded YouKits HB1B 5-band CW-only transceiver. It was built by Hanz, W1JSB, under his excellent RadioSet-GO brand. The rig contains almost everything needed to get on the air quickly: 4Ah of battery, integrated touch paddle and keyer, and other major improvements on the stock HB1B. It covers the 40, 30, 20, 17, and 15 meter bands, and can also receive single sideband in a pinch. It spits a whopping 4 watts into the antenna. The "everything in a Pelican case" philosophy behind this radio means I don't have to carry, remember, or set up a bunch of peripherals. All I technically need is the radio and an antenna, and I'm good to go. If I could add one feature to this rig, it would be a built-in tuner. I doubt there is room in the tiny enclosure to add the needed boards. Instead, I carry the excellent battery powered LDG Z817 tuner, and connect it inline. I only need to touch it when I change bands. Elapsed time from walking out the office door to first CQ is about 15 minutes. This leaves me the better part of an hour to wrangle a Q or two out of the ether. I almost always make at least one contact, usually two. 40 and 15 meters are the most reliable bands for me. So far, my farthest contact using this setup has been Iowa. Most of my contacts have been within a few hundred miles of the office. I'm used to hunting DX contacts thousands of miles away, but so far, that hasn't happened using this portable QRP setup. A sample of where I was heard today. That's actually just fine. To me, it's still pretty damn amazing that I can sit on a rock with this tiny radio and talk to people two time zones away, with the ionosphere as the only suppoting infrastructure. Once I've made a couple of contacts, it's time to pack up and get back to work. Tear down time is about ten minutes. After sitting in nature, talking to distant old men using patterns of beeps (Morse Code, y'all), I feel refreshed and relaxed. I can look forward to spending the rest of the day staring at a computer screen, because I've given myself time to unplug and do something totally different for a while. Everyone creates balance between work and downtime somehow. I think a lot of folks do it in a multitasking fashion: work for a bit, browse YouTube or read the news, alt-tab back to work for a bit, and so on. My own experience is that if I do it that way, I lose the flow of what I'm doing for work, and the little bursts of personal time aren't that rewarding. Playing radio is a nice counterpoise to the focused (and highly instrumented) work periods I enforce for myself. Living on the eighth floor of an apartment building in downtown San Francisco isn't an ideal environment for an amateur radio station. I can't put up any permanent antennas on the building, and we have very little space for my equipment inside. Here's my current solution to that problem. The antenna is a Chameleon Hybrid Mini 5:1 unun attached to sixty feet of wire, dangling above Stevenson St. The antenna is attached to a long extension pole, which I carefully extend about ten feet out my eighth floor window. On the opposite end of the unun is a homemade set of four counterpoise wires. The two long counterpoise wires run inside the apartment and under the carpet, while the two shorter wires hang down outside the window. I can run all bands, 160 through 6 meters, but I do have to use the internal ATU in my FT-450D. This setup takes about ten minutes to deploy or take down, which is great. I haven't done any antenna pattern modeling, but if I did, I suspect I would find that the antenna's close proximity to the building degrades its performance. In addition, downtown SF is an extremely noise-rich environment, both to the human ear and to my radio. I think I get better results by going on the roof with a portable vertical and my KX3. I may eventually abandon operating from inside my apartment at all, in favor of weekend portable operation from the roof or local parks. The main advantage here is that I can have a relatively normal operating position, sitting at my desk, with a 100 watt radio and a computer. Practicing Morse Code (CW) off-air can get pretty boring. Sure, you can get your iPhone app to send fake conversations, or practice various random words -- and there is value in all of that. But in the real world of high speed CW, it's all about being able to copy other people's call signs and their serial numbers. Enter Morse Runner. This is a Windows app (runs fine in a VM) that does a great job of simulating CW contest exchanges, complete with variable speed, QRN, QRM, and fading. While I don't do a lot of contesting, I've found that Morse Runner is helping increase my immediate letter / number recognition speed. It's also a nice break from doing word practice on LCWO. For me, the best part about Morse Runner is that it almost makes CW practice into a game. I started out with the speed set to 20 WPM, and over time I've progressed to running at 38 WPM. The app sends the simulated callers at variable speeds centered around the target CW speed, so if you set it to 38 WPM, you'll get anything from about 25 to 40 WPM. I don't usually get the 35+ WPM calls on the first try, but after a couple of repeats, I can nab 'em. K7OG has written a connector that lets you use the N1MM contest logger to log the calls sent from Morse Runner. I'll probably give this a shot if I get more serious about contesting and want to use N1MM regularly. 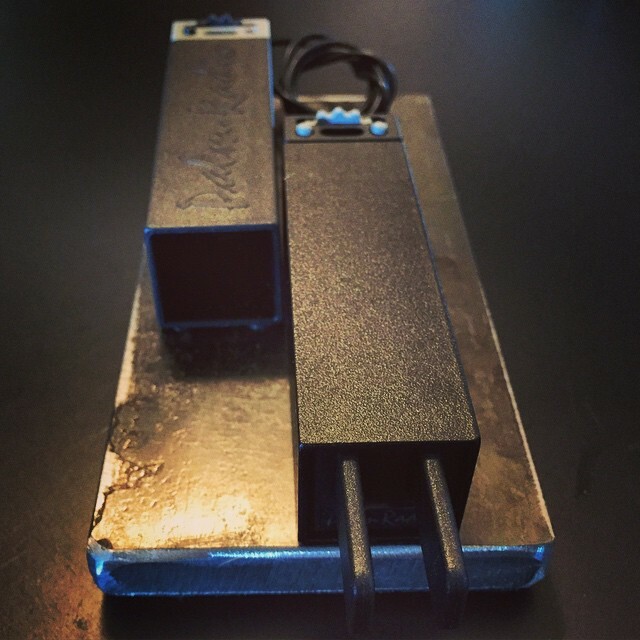 What would be really cool is if you could connect a paddle + keyer to Morse Runner and have the option to send the exchanges programatically from Morse Runner as well as manually, from the paddle. This would better emulate the setup that most folks use in a contest, as well as giving you the freedom to send partial calls without triggering the automatic exchange in Morse Runner.